The original intent of this article was to elaborate on potential use cases of “The DAO” for Liberland. With the recent issues with “The DAO”, this article will instead focus potential use cases of DAOs (in general) for Liberland, with lessons to learn from “The DAO” failure. DAO concept was first introduced in 2013 when Vitalik Buterin, one of the founders of Ethereum and “The DAO”, started exploring the concepts in a three part series. a software running on a decentralized database, a blockchain. DAO’s decentralized/distributed nature is inherited from its blockchain backend characteristics – just as Bitcoin is, because it is run by a large number of peers, none of which having a privileged position. On top of that, it is generally assumed that decision making, revenue sharing and any other “company process” is equally shared over DAO members according to the rules “set in code”. DAOs are autonomous from the fact that no human action is required in the decision making process. Humans may have to feed databases with information – even though that could be replaced by machine input – but no executive officer is at any time involved in the decision making process. All decisions taken by the DAO are taken on the basis of its code – a.k.a. Smart Contract as introduced by Nick Szabo – which defines the rules of decision making. Smart contracts are simply one method for restricting the transactions performed in a database, they are software involving digital assets held by multiple parties in which assets are redistributed according to a formula, input and variables known at a point in time. Smart contracts are autonomous as far as coded: e.g. a video loop will loop by itself in an autonomous manner: without external intervention but will not pause or slow down if not coded to do so. Contacting external services – is the service provider to be trusted? Enforcing on-chain payments – who really controls funds? Hiding confidential data – public blockchain isn’t private, is it? This is undoubtedly a useful thing, and is essential to making that database safe for sharing. But smart contracts cannot do anything else, and they certainly cannot escape the boundaries of the database in which they reside. Per definition an organization is an entity comprising multiple people, such as an institution or an association, that has a collective goal and is linked to an external environment. 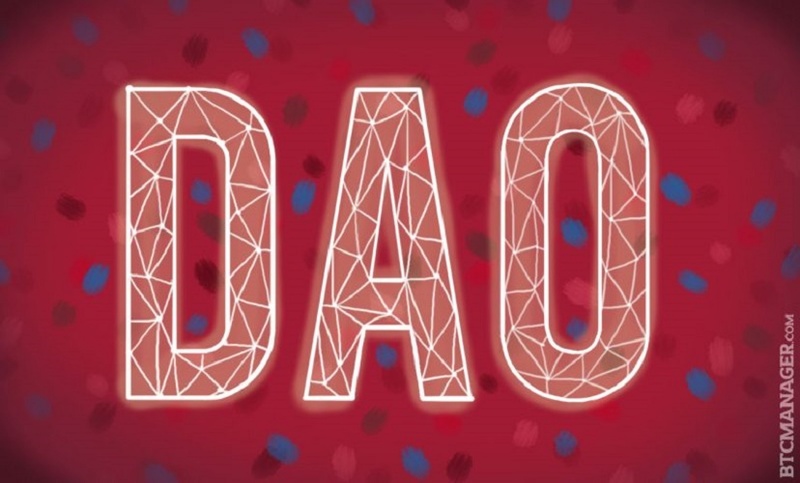 A DAO is indeed a group of multiple people, the token holders, which share a common goal as defined in DAO code but isn’t linked to any external environment per se since it is designed to run exclusively on the blockchain and where external service would break its autonomy. Again, DAO organization is defined by its code. As any business defines who is responsible for what, DAO codes defines and dictates interaction between its member, the decision making process and how members are rewarded from their participation. In such organization, every participant is on the same level as others depending on their participation (DAO assets held by participant). In such type of organization, decision making is crystal clear, it follows the codes and that’s it. Provided all goes well, it is perfect in a sense that it may prevent corruption, allow easy auditing and is known to everyone: the same variables always gives the same results. Provided all goes well, this is more than fine but at the moment something goes out of the code, DAO cannot act upon and no decision will be taken by a DAO if it was not design in its code. As highlighted by Stephen Palley DAO rises legal concerns. As a matter of fact, DAO do not exist on a legal point of view implying that its members may be liable on a personal basis for partnership obligations, As a legal matter, it doesn’t seem really possible to abstract human agency, ownership, or control from an entity. Moreover, since DAO do not legally exists it may not contract service providers, rent a building, take legal actions or even sign a contract… So legally speaking, a DAO may actually only act within its blockchain boundaries. On top of legal concerns as highlighted above, Preston J. Byrne, DAO raises concern with regards to its governance model. As a matter of fact the BitShares community (who had created one of the first DAO) has learned it the hard way and did eventually failed due to poor voter participation and an anti-spending movement, a so called “yes bias”, in which token holder would be unable to bear the short-term paper-loss and psychological impact of a lower market cap funding projects that project funding would cause. What is there to learn from “The DAO” failure? The DAO is programmed to run as a Decentralized Autonomous Venture Capital Fund – open to anyone. It’s code and only it’s code define how it runs and execute contract. From The DAO website: it is borne from immutable, unstoppable, and irrefutable computer code. And this is exactly what happened during “the issue”: this autonomous organization coldly executed it’s immutable, unstoppable, and irrefutable computer code in which a flaw allow a single (group of) user(s) to move – for personal use – about one third of total funds controlled by “The DAO”. Per se, “the issue” isn’t a hack but a cold execution of the immutable, unstoppable, and irrefutable computer code. This reminds us that smart contract aren’t smart – smartphones aren’t smart either by the way – they are just dumb computer code that executes as they have been programmed to do so. Computer code has no safeguard and doesn’t have any sense of morality: anything happening beyond programming scope might lead to unexpected cold result. To conclude, DAOs autonomy are limited to their code. Critical function should always be controlled by trusted parties to minimize risk and until automation is fully tested and fully functional – would you take a ride on an untested autonomous flying drone, released by an unknown group of people ? Liberland, a Centralized Organization ? Today Liberland functions with a very rudimentary form of governance with a classic top to bottom organization mixed with a less classic bottom to top flavor. Basically, Liberland’s head of government is setting the path forward by giving general directions. Tasks are then cascaded down to Ministries and/or local representations. Tasks are then picked-up voluntarily by Ministries, local representations or individual members of representation (tacit agreement). Whomever completed or participated in the task is then rewarded with Liberland Merits (LLM). On the other hand, Ministries, local representations or individual members of representation may work on tasks of their own, which once completed and recognized valuable by government will be rewarded with LLM. As we can notice, Liberland organization is pretty much organic: it is distributed in the sense that each and every representation office work their share while remaining autonomous. However, single point of failure remains with central government, having the exclusivity on who deserves to be awarded with LLM. And this is precisely where DAO model could help Liberland to grow further more efficiently. As demonstrated by The DAO failure, even though technology is readily available, it needs to be deeply tested before been described as autonomous – which, in my humble opinion, shall gradually become available with the advance of AI. For the time being, the focus shall be on Decentralized Organizations (with capital) of Decentralized Applications (without capital), where critical task are human controlled until automation (autonomy) code is fully tested. Such organizations/application, could allow significant efficiency, transparency and automation. Similar to what BitNation or Estonia  has developed, a Decentralized Application for eCitizenship could be used to issue, verify and amend Liberland’s citizen vital records. It could be designed in a way where government owns an unlimited numbers of ID which Liberland could “transfer” through its citizen. Once someone acquires Liberland citizenship, he’ll be granted a unique private key, his ID, which could eventually remove the need of ID documents since anyone could proof by signing documents with their private keys. One could then use their private key to update their vital record, to be also signed by Liberland government to “seal” the amendment in a blockchain. Of course, such application should be designed with the KISS principle: Keep It Stupid Simple, and run on most popular devices and OS available not to discourage ones to use it. Leveraging the advantage of blockchain and utilizing decentralized ID system, Liberland could develop a decentralized voting platform. With citizens having their ID registered on a DA, election authority would simply need to setup the voting period. Election would then open to every Liberland citizen whom would be able to vote for anyone with a Liberland ID – of course we may want to have an application that would suggest to vote for citizen who are candidates. Because of its blockchain backend, such application would allow to follow election trend in real time, making sure each vote is properly casted while maintaining anonymity and ensuring no illegitimate votes were added. Land registration is very similar to currency ownership in the sense that one cannot sell a piece of land twice (double spending resistant) and as such makes it an ideal asset to be handled by a Decentralized Application. Liberland could develop a system in which property title would be created as per Liberland cadastral plan with private signature owned by Liberland government. We could imagine a smart contract which tracks for payment of a pre-negotiated price to a unique address, acting as notary service, and which would automatically transfer property title to payer upon payment. On top of that, analyses tools could be built on top of a land title application to allow analyses of Real Estate markets and eventually lead to amendment to Liberland urbanization plans. Liberland should take advantage of this nascent technology and more especially since Liberland has no land title transfer history. It is worth noting that several countries, such as Ghana, Georgia or Sweden have already implemented or are implementing similar technologies. Similar to the now defunct The DAO Liberland may develop a “venture capital” DO in which government or any citizen will issue a task and assign LLM value to it. Anyone will then be able to claim that task, and claim the merits upon executing it. We could compare it as a Liberland Investment funds not limited to high value project or project ran by people with connections. In short, crowdfunding for everyone with a good idea. Liberland will just need to define the rules with regards to whom can invest, whom can propose and whom should benefit. In other word, should this application function with LLM only? For/by Liberland citizen only? With application in Liberland only? Liberland has the luxury of starting from a blank page while having at its hand promising technology. Liberland should not miss this train and ride it as soon as possible to leverage all advantages decentralized application and organizations have to offer. It is also an opportunity for Liberland to innovate and become a model for other nation to which I am pretty confident Liberland will be succeeding. This article has been written in June 2016, by Simon J. Castaño, member of the Representation of the Free Republic of Liberland in the Netherlands. With question / comment you can contact netherland-office@liberland.org. Anyone is more than welcome to participate in our on-line discussion on the subject.